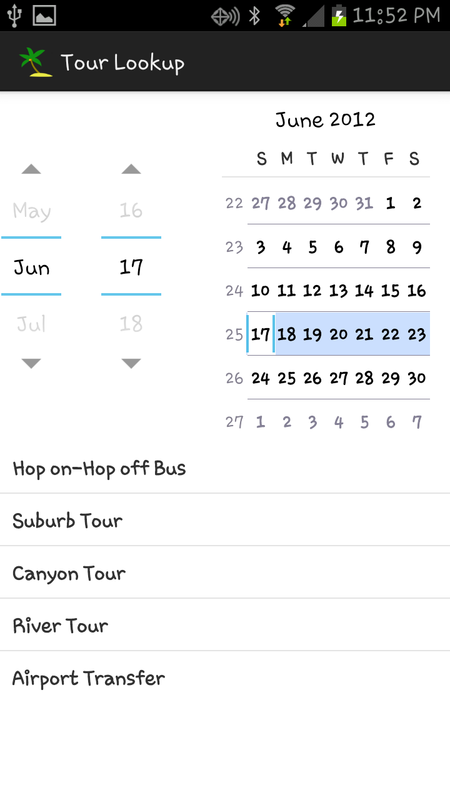 This example demonstrates how easy it is to create an Android app that can communicate with travel sites using the opentravel.org message schema. The JiBX open source project is a java data-binding utility that simplifies handling of xml schema. The JiBX schema library includes pre-built bindings for many message schema, including the complete opentravel schema. 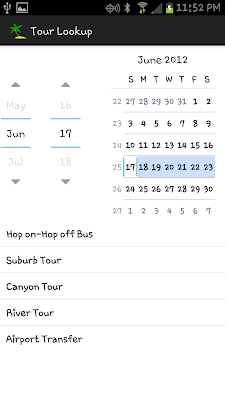 This app uses the 2011B version of the opentravel touractivities search request and reply. To illustrate what is happening, let's jump right into the actual source code. I create an opentravel xml touractivity search request and then read through the returned xml reply message. As you can see, manipulating the xml with java objects instead of xml makes the code easy to understand. The rest of the code in this application handles the UI and the client calls. It should be familiar to any Android programmer. One of the nice features of Android is the inclusion of many popular open-source libraries, such as the Apache http Client library and the XMLPull parser. This app is pretty simple. Setting up your development environment is a little tricky. First, you will need a server that is set up to service your requests. Just follow the steps in my post here: http://blog.tourgeek.com/2012/04/creating-soap-and-rest-services-for.html . Make sure the server is working by pointing a browser to the server with this url (just replace this IP address with your server's IP): http://192.168.1.100:8181/cxf/touractivity/search/2012-09-04/2012-09-04 . You should get an XML reply message. Our app will be (html) posting a RESTful XML request rather than using url parameters. Now we're ready to create our Android application. I prefer maven for my Android development since it automatically includes all the correct opentravel binding modules automatically . You will need to set up maven for Android by following the directions here: http://www.sonatype.com/books/mvnref-book/reference/android-dev.html . Make sure you have deployed android 4.0_r3 into your local maven repo. Now install your .apk file (from the maven target directory) onto your Android device. You should see the tour display. 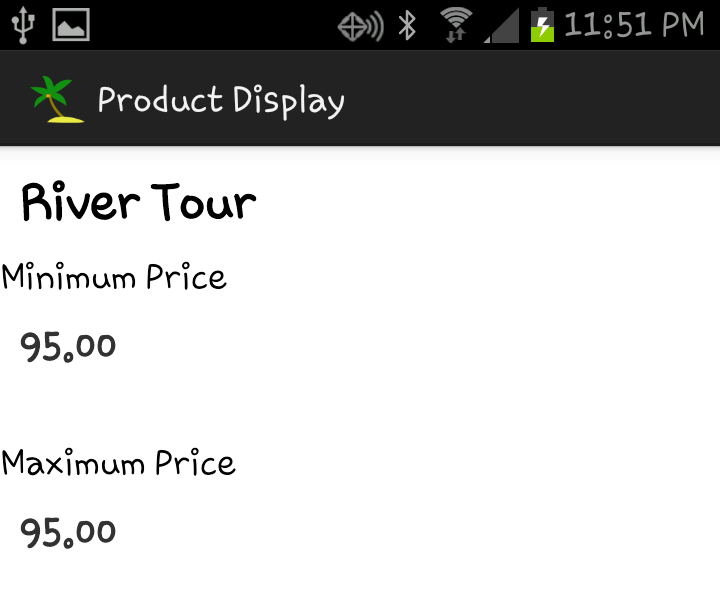 Try changing the date to update the tour display (Some of the tours do not run on Tuesdays). Take a look at the source code. You'll be amazed at how simple it is. I hope this example helps you create your own app using the opentravel schema. If you have questions, contact me at don@tourgeek.com or place a comment in the space below. Really a great application of android. Thanks for posting it. Worth researching for. Thanks for sharing this blog. Very informative post.I like this post. Mooie post over android applicaties echt in dit bericht heb je aandeel zeer interessant en informatica de belangrijkste punten voor ipad deveopers.thanks voor het delen van uw ervaringen. Good application and the resources you provided is very helpful to me. JiBX is a device for executed XML information to Java Objects. It's extremely versatile, enabling us to begin from current Java value.now JiBx also used in Android Development. That is a cool mobile android application! I just wish that the iphone application development in Sydney would provide an app similar to this one. Being a part of an application development in sydney is one of the things I want to be. That is the reason why I study programming very hard. Aside of becoming one of the web developers in perth, I'm also aiming to be an application developer capable of making applications just like this one. Really android is android. And awesome article for Mobile App Developer. Being a Innoppl Mobile App developers Atlanta, These would be so useful.How to write a technical blog for that, this will be an awesome example. Really good for app developers like me. Thanks for sharing. Helpful information for android app developers. As a Los Angeles android app developers, we really thanks for providing this great resources with technical code. Thanks for posting it, very helpful information for mobile app developer. As a mobile app developer in India, we really thanks for providing this great resources with technical code. Its a app world!!! every body want new and hightech apps for their phone. This app is a great app. I have a good idea for an APP and would like to work with a developer on creating the APP. Great blog having useful information. Thanks for sharing this content. Technology is growing in all fields. What a application means just fabulous! . 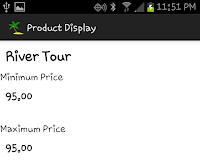 Now we can communicate with travel sites by means of mobile android app. It really helpful to everyone and time saving method. Latest Version Apk Download for Android Free, you can here free download Viber APK Android file and that too latest version. Took me time to learn all the comments, however I actually enjoyed the article. It proved to be Very helpful to me and I'm sure to all of the commenter right here! It's always nice when you can't only be told, but in addition entertained! This is very informative post. You have explained technicality very nicely. Thanks for sharing the useful information. Excellent blog with many useful information about Mobile Apps Development. I am planning to do Android Training in Chennai and kindly please suggest me is the best place for Android Training . If any other Android Training Institute in Chennai is their please let me know. Thanks for blog and thanks for reply guys. Truly marvelous online journal. Hadoop Training in Chennai Your site is truly noteworthy for me. Oracle Training in Chennai A commitment of thankfulness is all together Hadoop Training in Chennai for sharing this lighting up online journal. Keep update your online journal. Your posts are indeed useful. Cloud is one of the tremendous technology that any company in this world would rely on(Salesforce Certification). Using this technology many tough tasks can be accomplished easily in no time. Your content are also explaining the same(Salesforce crm training in chennai). Thanks for sharing this in here. You are running a great blog, keep up this good work(hadoop training). Great information, I really like all your post. Informatica is such a course that requires learning the technological features of the product. visit our site for more details.. This information is impressive..I am inspired with your post writing style & how continuously you describe this topic. After reading your post, thanks for taking the time to discuss this, I feel happy about it and I love learning more about this topic..
Hello Admin, thank you for enlightening us with your knowledge sharing. PHP has become an inevitable part of web development, and with proper PHP training in Chennai, one can have a strong career in the web development field. We from Fita provide PHP training in Chennai with the best facilitation. Any aspiring students can join us for the best PHP training in Chennai. I am looking for Android Application Development in case you know so tell me in light of the way that i prerequisite for my new pursuit. Extremely Solid Conception! It's really one of well written source about Mobile App Development. I am also one of mobile app developer and such features really makes me crazy about it. This is the more impress for me thanks for sharing this post,then the more information to get after refer and the easily to understand all articles . Whatever we gathered information from the blogs, we should implement that in practically then only we can understand that exact thing clearly, but it’s no need to do it, because you have explained the concepts very well. It was crystal clear, keep sharing dude. Nice article. I like your blog. This is very useful post. This is really interesting, You’re a very skilled blogger. I have joined your feed and stay up for in the hunt for extra of your fantastic post. Also, I have shared your website in my social networks. Very nice info on Android technology. Android Training in Chennai offered at IICT in real time and practical manner by Android experts who have around 10+ years of IT Experience. If any one need check the IICT Chennai Reviews all the students are happy for the best android course. That's quite interesting to see such an android app. Looking nice! Thanku for sharing this technology..
Keep up the awesome work of sharing information so comprehensively. Nice article and great knowledge. Thanks for the share. I love this story and enjoy with your words.Please share etl testing vacancies in hyderabad in hyderabad. Excellent post regarding Java training. if you are looking for the best android certification center in Noida. KVCH is the best option to you. KVCH Provides best android summer training in noida. Excellent post regarding Android training. if you are looking for the best Android certification center in Noida. KVCH is the best option to you. KVCH Provides best Android training at very lowest price. Great insights and such a beautifully written article. Thanks for sharing it's highly appreciated. The blog which you have post is helpful for us to know about the android development and the advantages of android in some electrical devices. thanks for your information. Roulette online is fun as well as skydiving is only safer and free. internet roulette online Win big amounts just now and have nothing to regret.